I asked for tasty, very nutritious food and got it, and much more. Phyllis' recipes are wonderfully imaginative. Her office is your kitchen. Just let her go. Whatever she makes is terrific. The meal was scrumptious!!! No...it was OUTSTANDING!!! And on top of THAT... it looked too beautiful to eat. But... we ate and ate and ate and ate. Everyone raved about how wonderful it was. I thank you profusely for all your time and energy and ideas and especially... the execution. Phyllis' food is always fresh, interesting and memorable. She is gracious and easy-going and has a wonderful sense of humor, both in front of and behind the stove. She shops for ingredients, prepares meals and leaves your home spotless. How good is that! Phyllis is cranky and temperamental but her cooking is good enough to put up with her antics. Everything is prepared and cooked in your kitchen. Chef Phyllis Segura founded Cooking on the River, a personal and private chef company specializing in fresh, healthy, delicious foods in 2000. Chef Phyllis focuses on weekday meals for families, small dinner parties, intimate dinners, private cooking classes and demonstrations. Menus are designed especially for your tastes and needs. 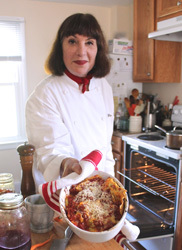 Award-winning Chef Phyllis Segura is professionally trained in Europe and the U.S. She has been active in non-profit organizations like the New York Women's Culinary Alliance, Rockland Better School Food Coalition and the Rockland Farm Alliance. She has cooked for the famous, the unknown and the slightly infamous. Give us a call today and start eating well with freshly prepared foods. Contact Chef Phyllis for rates and references. Gift certificates are available.